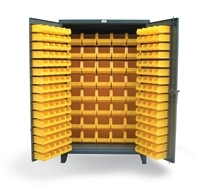 This is the all-welded heavy duty storage cabinet with bins on the doors and on the body. Organize, store and secure small parts in the 12 gauge steel bin cabinets. The bin storage cabinets meet virtually every need for organization and security. With a 3-point locking system, padlock hasp, and sturdy 7 gauge 6 inch tall legs, these cabinets are designed for industrial environments. You can store your smaller parts in the small bins on the doors. The bins on the doors are 4.125 inches wide x 7.375 inches deep x 3 inches high and can hold 10 lbs each. The doors are lockable with a padlock using our 3-point locking system. You can store you larger parts in the large bins in the body. The bins on the body measure 8.25 inches wide x 14 3/4 inches deep x 7 inches high and can hold 60 lbs each. The 6 inch tall 7 gauge legs are welded to provide mobility in lifting in order to move from one area to another. These heavy duty 12 gauge steel floor model cabinets provide protection for all your parts. These cabinets are built for rough and tough industrial use.